Food Intake and our health status have a direct impact on the quality and the quantity of sperms. Studies show that poor eating habits and sedentary lifestyle can reduce your fertility and affect the process of conception. 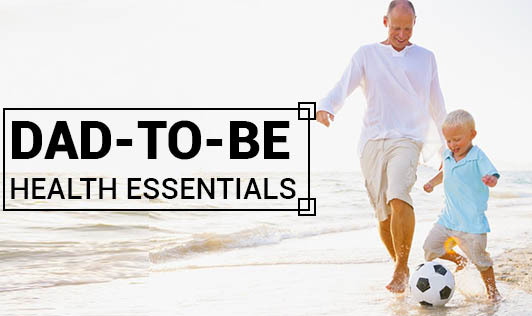 Here are a few habits that you could inculcate in your daily routine to prepare yourself to be a new dad. • Your diet should be as balanced and nutritious as your partners if you are planning for a baby. Both the parent's health play an important role in the development of a healthy baby. • Special nutrients to improve fertility include: zinc, selenium, vitamin D, calcium and antioxidants. The deficiencies of these micronutrients are linked to poor quality of sperms and reduced motility. So you should include lot of variety from all the food groups like plenty of whole grains, fruits, vegetables, moderate proteins like lean meat, fish, pulses and some low fat dairy products like skimmed milk and yogurt. Healthy Lifestyle: Maintaining a healthy lifestyle will definitely improve fertility. • Cigarette smoking reduces sperm count, so cut down and gradually quit smoking. • Restrict intake of alcohol and caffeine as they reduce testosterone levels and can cause erectile dysfunction. • High levels of stress can cause changes in hormone balance and affects sperm production. So, manage your stress with your favorite hobby or a distressing activity like swimming, exercise or meditation. • Try to be fit with regular exercise and maintain an ideal body weight.. Note: Do not take any kind of supplements or medicines without consulting your doctor for improving your fertility. These are a few steps you could take towards healthy pregnancy and a healthy baby!